You are currently browsing articles tagged higher education. Artificial Intelligence (AI) is transforming many human activities ranging from daily chores to highly sophisticated tasks. But unlike many other industries, the higher education sector has yet to be really influenced by AI, says Nafis Alam in a new post for The Conversation. Uber has disrupted the taxi sector, Airbnb has disrupted the hotel industry and Amazon disrupted first the bookselling sector, then the whole retail industry. It is only a matter of time then until the higher education sector undergoes a significant transformation. Within a few short years, universities may well have changed beyond all recognition. Here are five ways that AI will help to change and shape the future of universities and higher education for the better. 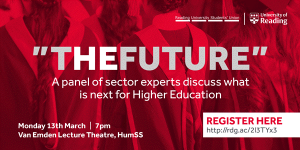 The University of Reading and Reading University Students Union (RUSU) are jointly hosting this engaging panel discussion on the future of Higher Education. Higher Education is always changing. Students, academics and other individuals working in the sector across the country experience this change first hand. This interactive panel discussion will examine the challenges facing Higher Education what changes these may bring. Questions from the audience for discussion are welcomed both on the night and in advance. Please e-mail your questions to President@rusu.co.uk or submit them on registration.